The length of the frost-free season (and the corresponding growing season) has been increasing nationally since the 1980s and is projected to continue to lengthen. Explore changes in the frost-free season. Nearly all studies to date published in the peer-reviewed literature (for example, Dragoni et al. 2011;1 EPA 2012;2 Jeong et al. 20113) agree that the frost-free and growing seasons have lengthened. This is most apparent in the western United States. Peer-reviewed studies also indicate that continued lengthening will occur if concentrations of heat-trapping gases continue to rise. The magnitude of future changes based on model simulations is large in the context of historical variations. A key issue (uncertainty) is the potential effect on observed trends of climate monitoring station inhomogeneities (differences), particularly those arising from instrumentation changes. A second key issue is the extent to which observed regional variations (more lengthening in the west/less in the east) will persist into the future. Local temperature biases in climate models contribute to the uncertainty in projections. Viable avenues to improving the information base are to investigate the sensitivity of observed trends to potential biases introduced by station inhomogeneities and to investigate the causes of observed regional variations. Given the evidence base and remaining uncertainties, confidence is very high that the length of the frost-free season (also referred to as the growing season) has been increasing nationally since the 1980s, with the largest increases occurring in the western U.S, affecting ecosystems, gardening, and agriculture. Given the evidence base, confidence is very high that across the U.S., the growing season is projected to continue to lengthen. The length of the frost-free season (and the corresponding growing season) is a major determinant of the types of plants and crops that do well in a particular region. The frost-free season length has been gradually increasing since the 1980s.2 The last occurrence of 32°F in the spring has been occurring earlier in the year, and the first occurrence of 32°F in the fall has been happening later. During 1991-2011, the average frost-free season was about 10 days longer than during 1901-1960. These observed climate changes have been mirrored by changes in the biosphere, including increases in forest productivity1,9 and satellite-derived estimates of the length of the growing season.3 A longer growing season provides a longer period for plant growth and productivity and can slow the increase in atmospheric CO2 concentrations through increased CO2 uptake by living things and their environment.10 The longer growing season can increase the growth of beneficial plants (such as crops and forests) as well as undesirable ones (such as ragweed).4 In some cases where moisture is limited, the greater evaporation and loss of moisture through plant transpiration (release of water from plant leaves) associated with a longer growing season can mean less productivity because of increased drying11 and earlier and longer fire seasons. The lengthening of the frost-free season has been somewhat greater in the western U.S. than the eastern United States,12 increasing by 2 to 3 weeks in the Northwest and Southwest, 1 to 2 weeks in the Midwest, Great Plains, and Northeast, and slightly less than 1 week in the Southeast. These differences mirror the overall trend of more warming in the north and west and less warming in the Southeast. Figure 2.10: The frost-free season length, defined as the period between the last occurrence of 32°F in the spring and the first occurrence of 32°F in the fall, has increased in each U.S. region during 1991-2012 relative to 1901-1960. Increases in frost-free season length correspond to similar increases in growing season length. (Figure source: NOAA NCDC / CICS-NC). In a future in which heat-trapping gas emissions continue to grow, increases of a month or more in the lengths of the frost-free and growing seasons are projected across most of the U.S. by the end of the century, with slightly smaller increases in the northern Great Plains. The largest increases in the frost-free season (more than 8 weeks) are projected for the western U.S., particularly in high elevation and coastal areas. The increases will be considerably smaller if heat-trapping gas emissions are reduced, although still substantial. These increases are projected to be much greater than the normal year-to-year variability experienced today. The projected changes also imply that the southern boundary of the seasonal freeze zone will move northward, with increasing frequencies of years without subfreezing temperatures in the most southern parts of the United States. Figure 2.11: The maps show projected increases in frost-free season length for the last three decades of this century (2070-2099 as compared to 1971-2000) under two emissions scenarios, one in which heat-trapping gas emissions continue to grow (A2) and one in which emissions peak in 2050 (B1). 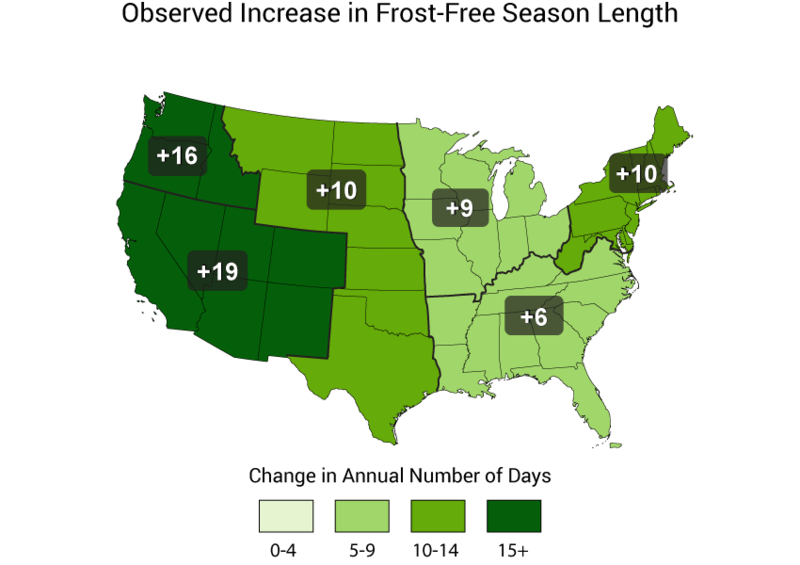 Increases in the frost-free season correspond to similar increases in the growing season. White areas are projected to experience no freezes for 2070-2099, and gray areas are projected to experience more than 10 frost-free years during the same period. (Figure source: NOAA NCDC / CICS-NC).